Goddess Postures derived from figurines depicting goddesses through time and across cultures is the focus of this workshop. Here is an opportunity to dive deeply into the many facets of feminine wisdom and power in the safe container of the Cuyamungue Institute, the land, and our group. This collection of Goddess Postures offers a wide variety of experiences, from the cool, detached, cosmic perspective to the personal warmth of the grandmother to quiet, fierce strength to nurturing in oneness to the well from which life emerges. In an on-going ‘dialog’ with the Goddess, we will also learn what she now has to teach us, gift us, and inspire us. Our spirit journeys in posture will be recorded verbally, in journals and discussed, as well as visually, as “art notes”. We will also select imagery from our spirit journeys to create personal mandalas (sacred circles in Sanskrit) to facilitate insight, healing and self-expression through art. In all of our Goddess work, these postures will open up new avenues to direct experience and wisdom of the Divine Feminine. The purpose of this workshop is to take another step towards claiming our feminine power and wearing it fully and gracefully. What You Will Learn: Five Goddess Postures to use in your daily life as a means to draw upon the wisdom and strength of Divine Feminine. Ways to translate visionary imagery into art. Embracing and recognizing the many ways the Goddess calls us. Included: Room and Board during the workshop. A day’s stay before and after the Workshop dates. Art Materials. Who is Welcome: Women who have done Goddess work in other avenues. Women for whom this will be a first dive into Goddess work. If you are new to the Cuyamungue Method, please attend an introductory workshop before this workshop. For your convenience, a special, optional introductory workshop is offered just prior to this one, all day July 10th and the morning of the 11th. This workshop will introduce you both intellectually and experientially to the spirit journey postures. You will learn the history of Dr. Goodman’s discoveries, and the physiological shifts that easily and naturally take place during practice of the Cuyamungue Method of spirit journeying. You will ‘get launched’ through several sessions over two days in the kiva. We will journal and share our experiences as a group. There will be plenty of time and opportunity for Q&A. This workshop is open to all who wish to learn this work. Arrive by 6 pm on July 9th or the morning of the 10th. Cynthia’s passion for painting was recovered though like so many people, she’d forgotten to take enough time for her spiritual core and artistic expression for long stretches of years. She has gradually been guided by her holistic practices back to art , intuition and the essential Feminine. Now, primarily using acrylics and watercolors, Cynthia describes her paintings as ‘intuitive art”, tapping into her dreams, inner visions and senses. She shares her love of the creative arts by teaching mandalas(sacred circle art)in individual and workshop settings and working with her local art community. A number of wonderful art,yoga and dream courses assisted her own dive back into the deep well. 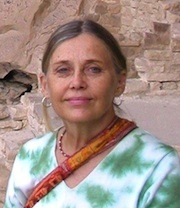 These studies and her personal practice helped set the stage for her involvement at the Cuyamungue Institute . After her first CI workshop Cynthia wrote that engaging in the posture work took her dream guidance to “eat art” to a new level. Having the opportunities to enter the postures illustrated in the ancient art grounds the meditative experience in the essential Feminine. She joined the CI Board in resonance to the transformational experiences (facilitated by Paul Robear and Laura Lee and then with Nick Brink.) with great interest in supporting CI community’s commitments and evolution. She is in the process of completing the requirements for the CI Instructor Certification. As a psychotherapist, Cynthia has a strong foundation for a holistic counseling approach which values inner and outer resources. Over the years at Devlin Counseling Center, Cynthia has enthusiastically encouraged others to develop a personal practice which includes accessing our greater unconscious and Self. Cynthia is a Licensed Professional Counselor and Marriage and Family Therapist in Virginia. Her independent counseling practice, Devlin Counseling Center (www.devlincounseling.com) has served the Heartland of Virginia community for 20 years.